Professional soloist, Cheri Rose Katz was brilliant. 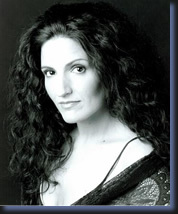 "Cheri Rose Katz, gives strong voice to Fricka, Erda and Flosshilde". Absolutely wonderful with a true Verdian voice, giving the ideal quality of sound for this work. The sixth movement featured a rich, beautiful solo by Mezzo Soprano Cheri Rose Katz. The singing symbolizes the sense of loss brought on by the battle. Katz sings of a search for her loved ones among the dead bodies of the brave Russian soldiers. The cantata is an amazing adrenaline rush. At the end, the audience gave the performers an extended standing ovation, thanking them for taking them on such a fantastic journey. Cheri Rose Katz, in the dual roles of Erda and Waltraute was of excellent voice and presence. "One must single out Cheri Rose Katz for a beautiful voice and beautiful quality of singing in the dual roles of Erda and Waltraute." Cheri Rose Katz makes a brief but effective appearance as Teresa Panza, Sancho's wife. "In their relatively minor roles Burkhard Ulrich and Cheri Rose Katz do all that is required of them, and do it with assurance and conviction." The cast was often very good. Particularly notable was : the polished Cheri Rose Katz in a mezzo-soprano role of a willful courtesan who kills Edgar’s true love. "Very talented soloist,Cheri Rose Katz"
entertaining production that boasts a strong cast, and mezzo-soprano Cheri Rose Katz as Marthe, a comic foil to Mephistopheles. Soloist with the Greater PrincetonYouth Orchestra,Richard Strauss’ Morgen [Opus 27, No.4] and Zueignung [Opus 10, No. 1]. Katz, has distinguished herself once more performing,Richard Strauss’ Morgen [Opus 27, No.4] and Zueignung [Opus 10, No. 1]. Her dramatic mezzo-soprano voice, noted for its beauty of tone and stylish musicality thrilled the audience. We beheld a beautiful young woman gifted with a strong, expressive voice. "Cheri Rose Katz displayed a rich voice of dark, majestic timbre and deep sonority. The long musical phrases, constructed with great skill and excellent articulation. were very organic." The first to take the stage was the Prepare the Way Concert tour 2007 choir. They captivated the audience as they were joined by members of the Palestinian Youth Orchestra and internationally known soloists Stuart Neill, Sandra Lopez, Cheri Rose Katz and Horace English. They offered a message of justice and peace in Bethlehem and to the whole world as they concluded their performance. The villainous brother and sister, Sparaficile and Maddalena, were taken by experienced low-voiced singers. As the voluptuous Maddalena, mezzo-soprano Cheri Rose Katz’s lush, full sound bordered on that of a true contralto. The Contralto, Cheri Rose Katz, embodied the perfection of the earthly Teresa. The accompanying roles, particularly Cheri Rose Katz as Frugola, were all cast from strength. Among the altogether good singing and even better acting of the Rhine daughters (Fionnula McCARTHY, Woglinde; Ulrike HELZEL, Wellgunde) Cheri ROSE KATZ, as Flosshilde, distinguishes herself. Cheri Rose Katz, in the thankless role of the page, makes one listen attentively! Apart from the sovereign Cheri Rose Katz (Annina), the remaining singer ensemble was too lackluster.